"We've had multiple leads, all of them have been false alarms…" STX Entertainment has debuted a short, but sharp, trailer for Billy Ray's mystery Secret in Their Eyes. Julia Roberts stars along with Nicole Kidman and Chiwetel Ejiofor, in this thriller about a team of a FBI investigators who look into the brutal murder of one of their own teenage daughters. Roberts plays the mother, and man does she look hell bent on revenge getting justice in this role, and is it going to be sweet to watch her get it. This new trailer plays more like a quick TV spot, but it's just a fast-paced look at this thriller hoping to find an audience. Fire it up. You can still watch the first official trailer for Secret in Their Eyes here, for more footage. A tight-knit team of FBI investigators, along with their District Attorney supervisor, is suddenly torn apart when they discover that one of their own teenage daughters has been brutally murdered. The film is a remake of Juan José Campanella's Oscar-winning 2009 film The Secret in Their Eyes, with Julia Roberts' part rewritten from male to female. "She saw the potential in there and didn’t ask [the director] to rewrite the part too terribly much in order to make it a woman. She just dove in." 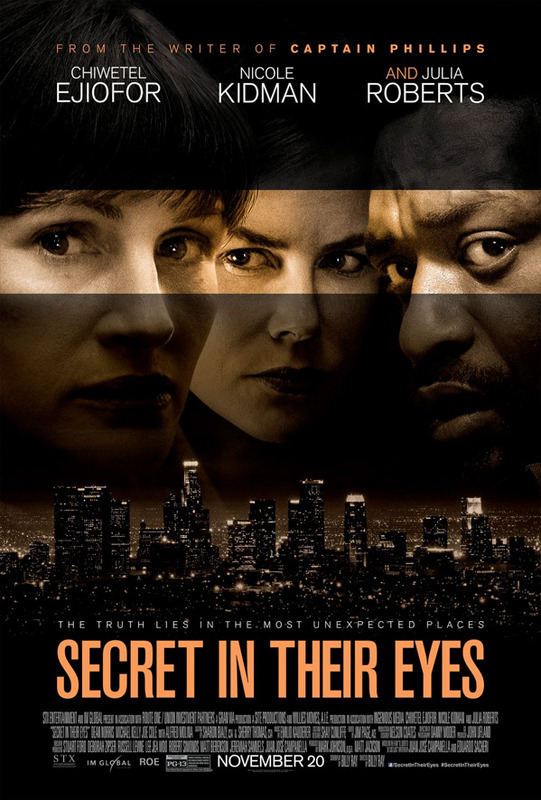 Secret in Their Eyes is written & directed by Billy Ray, an Oscar-nominated screenwriter and director of the films Breach and Shattered Glass previously. STX will release Secret in Their Eyes in select theaters starting November 20th this fall. Another pointless remake, the original is so good. I think you mean TWO Oscar winners, right?